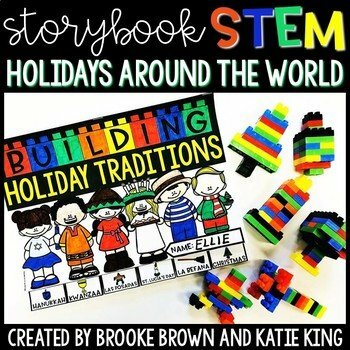 This special edition of Storybook STEM combines informational text, research, simple building brick STEM challenges, and math extensions for six winter holidays around the world: Hanukkah, Kwanzaa, Las Posadas, St. Lucia’s Day, La Befana, and Christmas. Holidays can be taught one or two per day or all six holidays can be taught in one day. The provided PowerPoint (separate file) provides necessary background knowledge for each holiday and can be read and discussed as a class. There is also a culminating Readers’ Theater that incorporates all six holidays. Research mats are also provided with QR codes and clickable hyperlinks for students to research each holiday on their own devices. The links contain student-friendly articles and videos. The six LEGO/building brick challenges can be completed one or two per day or set up in stations. The provided challenge recording booklet allows students to draw their creations and complete a math extension for each structure. There are also optional “Fun Facts” pages for each holiday for students to record facts that they learned. Each student will need about 32 building bricks in various sizes with 4 pegs, 8 pegs, and 12 pegs to complete each challenge. You can either provide tubs of building bricks at each station or have them sorted into individual baggies for students to bring to each station. Inexpensive building bricks can be found in the Target party favor section or at the link below. These bricks would also make excellent student gifts for the holidays after they complete the building challenges. Optional gift tags are also provided.